The rising numbers drove a 40% rise in the European mobile data market which now stands at 7bn euros (£5.53bn). The GSM Association (GSMA) said there were now 112 million users of third generation (3G) mobile services in Europe - about 22.5% of all mobile users. By comparison 18.4% of US and Canadian mobile users are on 3G networks. The average cost of sending a text message while travelling in Europe fell by 18% during the year being surveyed. "We expect prices to continue to fall as operators further innovate around tariffs and more and more Europeans use these services as a part of their everyday lives," said Tom Phillips, chief government and regulatory affairs officer at the GSMA. In some nations, said the GSMA, mobile broadband services now cost as much as fixed line broadband services. The survey comes only weeks before EU imposed limits on roaming charges for making phone calls come into effect. 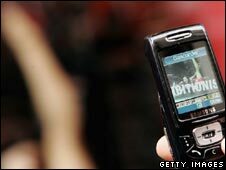 Approved in May 2007 the caps on charges could cut by 75% the cost of using a mobile to make a call outside a handset owner's home nation.